Ba-bam, it's time for another edition of What I'm Wearing, which, as you might have guessed, is the place where we tell you all about the wearables we're rocking this week. Some we like, some we don't, but all go through the same rigorous testing approach here at Wareable HQ before we pass judgement. This week, we bring Samsung's latest smartwatch back into the fold now that it's received a software update, and don a Timex timepiece with payment smarts. Like what you see? Well, if you think there's an accessory, watch face or device that you think we should check out, hit us up at [email protected]. If it passes the tests, you could see it on a future edition of What I'm Wearing. It's been a while now since Samsung launched the Gear Sport and we posted our full review, but we're strapping the sporty smartwatch back on our wrists this week as the Korean company continues to make software updates to its line of wearables. After bringing in changes to the Gear S2, Gear IconX and Gear Fit2 Pro, the Sport's update now has an improved layout for exercise information and readability, as well as the option to add a personalised target heart rate. And it's perfect timing too, since I'm currently testing the smartwatch against the Fitbit Ionic in order to get a better idea of the strengths and weaknesses of both as fitness devices. While I've not had a chance to go double-watch in the gym just yet, it's been a great feeling having the rotating bezel of the Gear Sport back on my wrist. There really isn't a better way of using a smartwatch, and I have no doubt it'll be even more useful when I'm trying to avoid touching the screen when exercising. 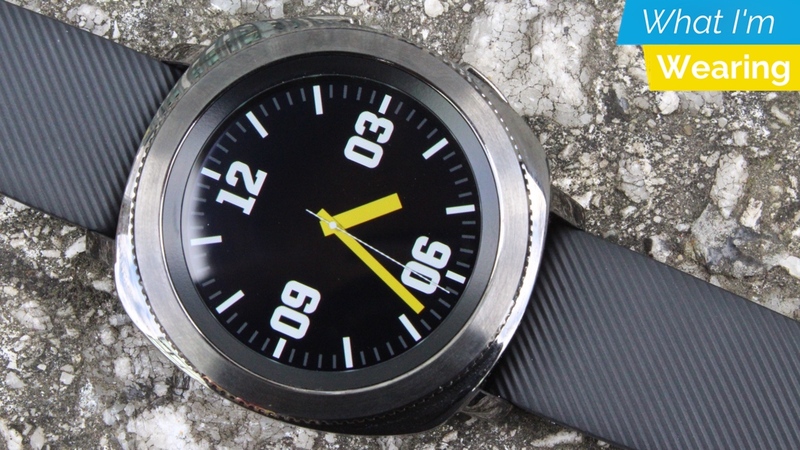 As for the band, well, it's not the flashiest out there, but I much prefer the feel and look of the Sport to the current flagship, the bulkier Gear S3. It's been quite liberating to wear a watch that keeps the smarts really basic. This Timex Fairfield doesn't count steps or send a vibrating buzz to your wrist when a notification comes in. Its sole smart feature lies inside the black leather strap. It's a contactless band (available in black or brown) powered by bPay, allowing you to make payments from the wrist. I've said it countless times, but payments should be a staple for smartwatches and hybrid watches, so it's nice to see it here. That strap is also attached to a pretty slick-looking analogue, Fairfield Chronograph watch with three sub-dials tucked inside the matte black watch face. It's slim as well, which is unsurprising when you consider there are no other smarts to conceal. But I'm enjoying the minimal tech. However, the payment features would be most useful when I'm out running, but I'm not sure I'd get sweaty with this watch. It's definitely the nicest device I've had to hold up to a pay terminal in a shop, though, and I'd happily spend a bit more time with it.